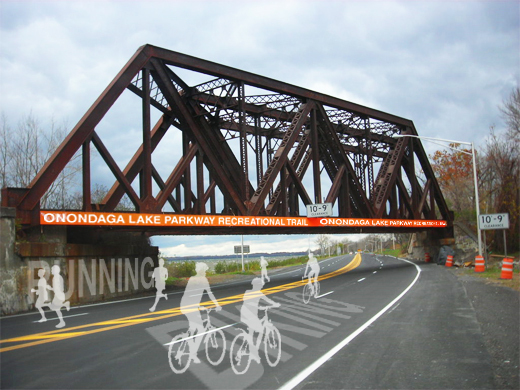 Onondaga Lake Parkway has been making headlines consistently for the last year, ever since the misguided Megabus tragically collided with the low railroad bridge. A flurry of studies and professional opinions have been flying around, attempting to devise the best plan to prevent future truck/bus-bridge collisions. Everything was on the table at first, from raising the bridge, to high-tech detection systems, to three-bazillion more signs along the way, but the the most obvious solution just so happened to be so un-flashy and low-cost that nobody brought it up: Why not close the parkway to vehicles all together? Before spilling your morning cup of coffee on yourself at the thought of less roadway for your daily commute, bear with me. Old Liverpool Road boasts 4 lanes of travel and runs parallel to the parkway, but it in reality hosts very little traffic currently, so should be able to handle traffic shifted from the parkway [and some of the traffic will naturally find other routes as well]. I-690 will still offer scenic views of the lake from behind the windshield. A few years back, FOCUS Greater Syracuse conducted a survey on improving quality of life in our area, and the number one wish by residents of Onondaga County was surprisingly not more downtown parking or a bigger mall, but in fact a wider, more extensive network of recreational trails. So re-purposing the parkway seems like a win-win -- no more vehicles colliding with the bridge, and more walking/running/biking/rolling mileage for recreational use [and even the potential added bonus of Liverpool residents being able to easily commute via bike into the city]. On top of that, it requires little cost in the short term to divert traffic and designate the parkway as car-free, unlike adding a slew of vehicle height sensors and signage... Over time, the roadway could undergo a facelift, as the northern portion of the old parkway did long ago, to look less road-like and more waterfront trail and promenade-like. Think of how well-utilized Onondaga Lake Park currently is -- it only seems natural to leverage its success and allow more of the lakefront to be accessed by the public. Ready for a jog? Agreed, with one additional point - anyone north of the Thruway should be taking 90 to 81 to get downtown, anyway. It's faster than going through the village. It is crazy that Onondaga County hasn't given serious thought to this idea. NYSDOT certainly hasn't helped the situation with its road-widening projects in the village. Why not even compromise and reduce that stretch to a two-lane road? Take the lanes closest to the water and create the recreational path, and maintain the outer (northbound) lanes, only switch them to two-way? I could imagine very little support for a proposal to close it entirely. Thanks, Jason, that's helpful. Looks like some combination of traffic calming/speed reduction on the Parkway and establishment of a fee-free zone on the Thruway (as exists through Buffalo) is preferred, though the latter is less likely. It's reverse induced demand: make it more difficult for people to drive on the Parkway, and traffic in the Village and on the Parkway should decrease. Thruway tolls aside, I hope lane and speed reductions, if not a wholesale closure, are in store for the Parkway. That strip of shore is an underutilized asset.